This workbook is designed with LOVE for all ages; it is approachable, fun, and progressive – a necessary go-to guide for anyone on their path to ultimate wellness. In stock. Ships via USPS Media Mail. Please allow up to 7 business days for delivery (based on the distance of the destination from Chicago, IL). 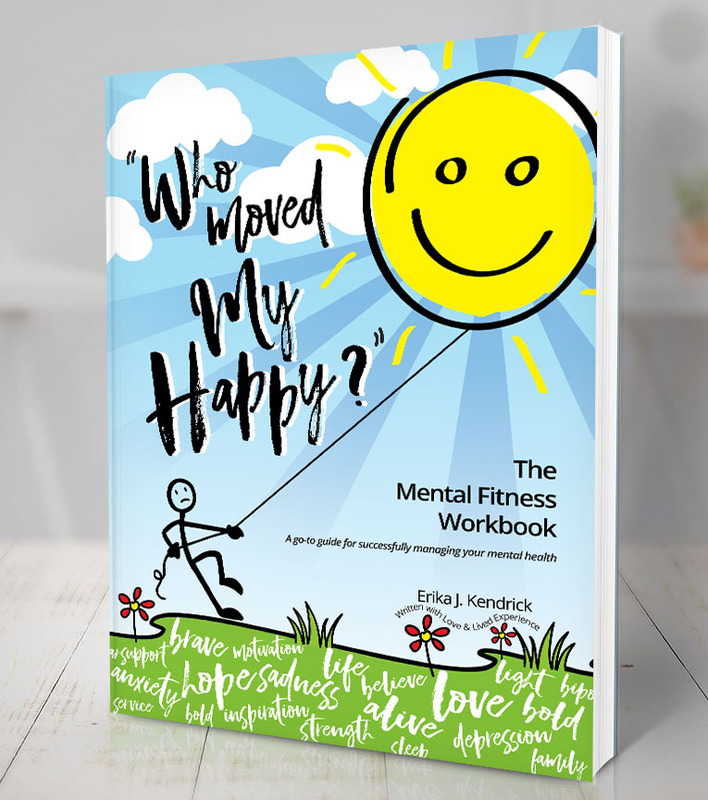 The “WHO MOVED MY HAPPY?” Mental Fitness Workbook is written with love and lived experience by someone who has walked suicide’s tightrope. Despite the epic challenges of mental illness, Erika remained determined to conquer bipolar disorder, psychosis, anxiety, and major depression. The Mental Fitness Workbook has been essential in helping her find and own her HAPPY and thrive in extraordinary ways. Between the pages, Erika shares personal stories, tips, and funny, raw anecdotes on her quest to find her HAPPY. The “Who Moved My Happy?” Mental Fitness Workbook teaches The Incredible 10: the ten Mental Fitness Steps to becoming happier, healthier, and empowered on your journey through life. The lifestyle steps are broken down into very real and basic strategies that allow you to rediscover pleasures, learn powerful feel-good coping strategies, and engage in life in new and meaningful ways. While you work to master each instrumental step, the chapters help you track, rate, and reflect on your progress. This workbook is designed with LOVE for all ages; it is approachable, fun, and progressive – a necessary go-to guide for anyone on their path to ultimate wellness.